Some six months ago Mhairi MacLauchlan (RSPB Cumbria Coast Warden) installed a stamp collection bin in the Wetlands Centre on Campfield Marsh RSPB Reserve. Due to the diligence of visitors to the Reserve and particularly to Dave Smith who has been collecting stamps from the local West Coast Group for quite a while now, we were recently able to dispatch our first posting of in the region of 7,000 used stamps in aid of this appeal. 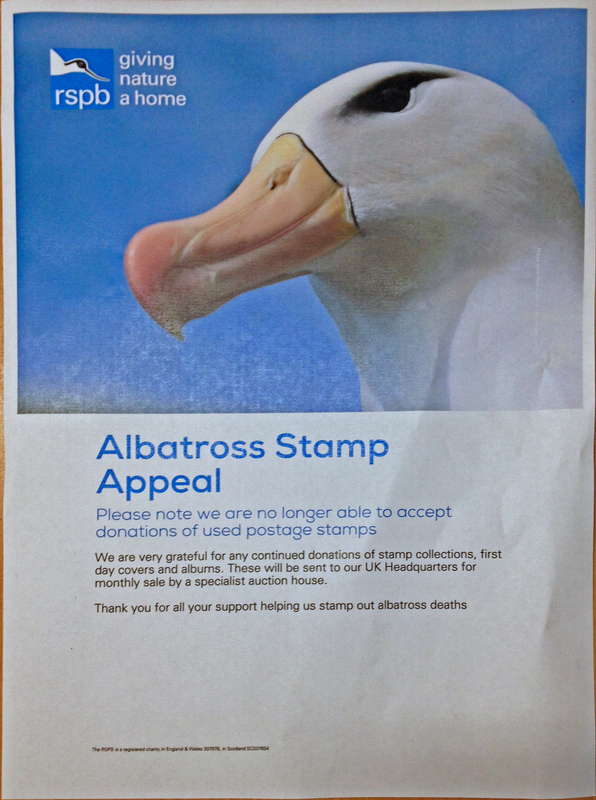 You may be interested to read the letter received today in reply to this, and follow the links in it with information about the Albatross Task Force activities which are funded by this Appeal. As Christmas approaches remember to continue to save your stamps. Perhaps you could enlist your family and friends to do so, also. RSPB consequently posted the above information.